It has to be satisfying for Mike Woodson, amidst all the criticism leveled against him and all the unflattering comparisons to Scott Skiles regarding in-series adjustments, for the Hawks to win a road game and extend the series to a seventh game largely because his team's underlying defensive philosophy worked marvelously. The third quarter, won 29-11 by the Hawks, showed what the Hawks hope to accomplish defensively by using their athletic frontcourt players to make up for the limitations of the team's perimeter defenders. Josh Smith and Al Horford were everywhere. They cut off driving lanes at the point of attack. They protected the paint when their teammates forced the ball toward the help. 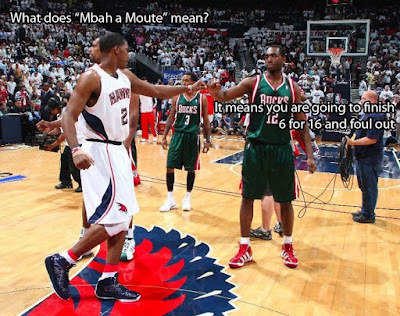 The Atlanta Hawks turned the Milwaukee Bucks into strictly a jump shooting team and, because the Bucks were not stretching and inverting the Atlanta defense, the Hawks could take advantage of Milwaukee's missed shots by controlling the defensive glass. The Bucks were 3-16 from the floor in the third quarter. 12 of those shots were jump shots. The Hawks grabbed 11 of 13 possible defensive rebounds. Add in the five turnovers forced and the Hawks enjoyed a brief respite from having to score against a set Milwaukee defense. Rarely is the interaction between offense and defense so clear. The relationship between the two aspects of the game was magnified by Scott Skiles deciding, in the understandable hope of finding some way and someone to put the ball in the basket, removed Luc Richard Mbah a Moute from the game three-and-a-half minutes into the quarter and Kurt Thomas four minutes later. The smaller Milwaukee lineup found slightly more offensive success than the starting lineup but those gains were more than offset by the ease with which the Hawks operated around the basket in the absence of Mbah a Moute and Thomas. Al Horford scored 9 of his 15 points in the third quarter. Josh Smith scored 4 of his 10 and each assisted on the two field goals (totaling five points) Joe Johnson made in the quarter. That last point was key on a night where Johnson made his first 3 field goal attempts but just 5 of his remaining 21 shots (and one of those five makes came with 10 seconds left and the Hawks up 11). Because of Johnson's struggles to create good shots for himself and his team's inability to commit to an alternative first option to reduce their collective degree of offensive difficulty, I suspect the team will have to mount a similar shared effort (both before and after Milwaukee attempts a shot) in Game 7. Also unable to get to the free throw line very often, they appear, through six games of the series, to need the offense their defense creates both in and of itself and for the pressure it can put on Skiles to find the right balance between the primarily offensive and primarily defensive players at his disposal. Then again, Game 7 might come down to which team makes more of the jump shots they're forced into or create for themselves. Games 5 and 6 were won by the team that made a higher percentage of their three-point attempts and both the Bucks in Game 5 and the Hawks in Game 6 made just 40% of their two-point field goal attempts. "If I call something, you’ve got to execute it. There were a few times plays were called, and we didn’t get to them because the ball stopped. The first two games we sacrificed the ball. If the ball goes inside and they don’t double you, go play. If they don’t double, then kick the ball [out]. It’s simple." I think the sentiments expressed are true. I think Woodson is frustrated after three losses. I think Woodson is frustrated that the rare, recent attention the Hawks have received is overwhelmingly focused on him being out-coached. I think Scott Skiles has out-coached Woodson. I also think the Bucks players have out-played their Hawk counterparts for most of the last three games. I think actions speak louder than words. I think the ball has been stopping fairly regularly for the better part of five years. I think it's disingenuous to couch this as a new or unexpected problem that needs to be dealt with now. I think this team is what it is. I think the last time the Bucks regularly doubled hard in the post, Carlos Delfino was matched up against Josh Smith. I think the Bucks will continue to show help but not double early (if at all) when Kurt Thomas has Al Horford or when Luc Richard Mbah a Moute has Josh Smith. I think, given how long it takes the Hawks to get into their half-court sets and how little movement those sets have off the ball, the ball will stop in the post, or, should it get kicked out, it'll end up in the hands of a guard, isolated, who will work hard to take a jump shot. I think offensive rebounding is going to be hugely important in Game 6. For the first time in my memory, a Hawks game takes up two positions in the Daily Dime. Jeremy Schmidt of Bucksketball uses the second spot to describe how unusual it was for the Bucks to get to the line as frequently (or, if you prefer, constantly) as they did in the fourth quarter. Just below, I give an abridged description of the meltdown from the Hawks' perspective. "We were terrible in the half court executing down the stretch." "We self-destructed again coming down the stretch. We’ve got to figure it out." "I wish I knew. I can’t say it’s been that way since the All-Star game, but it’s been that way against the Cavaliers. We’ve had close games against them, and we can’t find any offense in the fourth quarter." "We had our chances but we had a bad fourth quarter defensively. We gave up 31 points. We were solid on defense up until then. They got hot, made some shots. We matched shots but we couldn’t get stops when we needed top get them. We couldn’t control the dribble. Everybody just picked and choosed when they wanted to drive the ball." "I thought we played pretty steady throughout the ball game but coming down the stretch we just unraveled and didn't make the plays that we needed to make." "We played well enough to win tonight, but we were our own worst enemies down the stretch." "We just failed to execute coming down the stretch. We had a comfortable lead and we stopped doing the things that got us the lead. Defensively, we just shut down." "We can't predicate everything we do on making shots. I thought tonight we did that in the third and fourth quarter. We shut it down when we couldn't make shots. When you're missing jump shots, you've got to find a way to get to the free-throw line and we didn't do that tonight." Forgive me if I overlooked anything relevant. Like, say, more from April 28th at home against Milwaukee. "I thought we shot jumps shots and I thought we didn’t execute. We really had control of the game. Our composure down the stretch, we really just let it get away." "We really weren’t getting good looks. We were forcing some stuff and got away from some of the things that were working for us earlier in the game. We kind of got exposed on the offensive end." "We’re going to go win. No question about it. That’s the bottom line. We have to bring it back to Atlanta." "We'll just have to go up to Milwaukee and see what we can come up with." "It was a terrible loss. It was embarrassing." Costly too, perhaps, in more than one sense. "This is by far the biggest win of the season. We've still got business to take care of, so we've got to stay with it." [T]he Hawks were a disgrace. They rarely moved the ball from side-to-side, and were more interested in blocking shots than in playing solid defense. And exactly how did the Hawks try to manifest their spectacular advantage in talent? By running an endless series of isolations — 42 to be exact, which accounted for nearly half of their 83 total shots. Josh Smith, Marvin Williams, Al Horford, Iso-Joe Johnson and Jamal Crawford all were allowed to dribble this way and that way until they could find what they believed to be an acceptable shot. All of these individualistic exhibitions produced 40 points. Compare this situation with the Bucks, who ran 17 isos that generated only nine points. Only Williams (8-10, 22 points) and Horford (11-21, 25 points) rose to the occasion. Otherwise, Mike Bibby was 1-5 and useless; JJ was 6-16 and was smothered by Salmons; Josh Smith was 3-8 with 3 blocks and was mostly AWOL, and Crawford had a John Starks-type performance, shooting a ludicrous 4-18. Al Horford (25 points and 11 rebounds) and Marvin Williams (22 points on 8-of-10 FG) were productive, but the trio of Joe Johnson (13 points on 6-of-16 shooting and six assists), Josh Smith (seven points, nine rebounds, and three blocks), and especially Jamal Crawford (11 points on dismal 4-of-18 shooting) couldn't get it together. The offense struggled horribly late, full of stagnant one-on-one plays with little movement or chance for quality shots. Johnson fouled out on a pass-and-crash charge with 2:15 left, and the offense was noticeably directionless with him out, too. They can think it, and maybe that’s all they have to go on right now, but it doesn’t make it true. That Pistons team was led by tough-minded veterans. They’d already been to the East finals. They played defense with zeal in a system they were committed to. They shared the ball on offense and didn’t have a star who dominated the ball. The Hawks are nothing like that. They are facing elimination by a six seed missing its two best players and run by a rookie point guard. And they got to this point with a collapse that I’d call incredible except I saw similar Hawks folds so many times down the stretch. This was the Falcons blowing the lead against Danny White and Dallas in January 1981. This was Mark Wohlers hanging the slider to Jim Leyritz in October 1996. Only it wasn’t. It was worse. Those opponents were top-class. The Hawks just blew a 13-point lead and probably a playoff series to Milwaukee, which is a No. 6 seed missing its All-Star center. Guess the team never has quite learned those lessons from all the other games this year that this exact thing happened. Guess those "meaningless" games in the regular season that the Hawks fooled around and fell out of love with winning really don't magically disappear once the playoffs come. Guess that reporter after Game One who dared to ask Woody about this being a defining characteristic may have hit too close to home. All over the league, critics are going to say that the Hawks, who may have the highest knucklehead-to-talent ratio in the NBA, have blown it. But that wouldn't be giving full credit where credit is applicable. It was Ersan Ilysova making hustle plays while the bewildered, outsmarted, out-coached Hawks stood around and watched, much as the Bucks had in the first two games at Philips Arena. It was Kurt Thomas, in foul trouble for most of the game, taking a charge in the closing moments, the defining moment of a season that got Joe Johnson, one of the Hawks' most dangerous scorers, off the floor. How does a man end a game with a +21 +/- while attempting just one shot and going scoreless? Well, it’s actually a two part answer. Part one is he plays terrific defense and part two is his backups play generally horrible. That’s the story of Kurt Thomas on Wednesday. Al Horford may have scored 25 points, but just nine of them came with Thomas on the court. Horford wasn’t able to back Thomas down and get any easy looks the way he did when any combination of Primoz Brezec, Dan Gadzuric, Ersan Ilyasova and Luc Richard Mbah a Moute were on him. His defense on an otherwise dominating Horford will deservedly take a backseat to the monster charge he drew on Joe Johnson, but it was a huge relief for everyone rooting for Milwaukee when he checked back in to slow Horford in the fourth quarter. Folding up late in games is not some new thing for the Hawks, it's a season-long trend. Their execution goes away, their play calling is poor and/or ignored. At some point, that responsibility has to fall on coach Mike Woodson. He has not made an adjustment to counter Milwaukee's destroying the Hawks switch on the pick and roll. That play and the Hawks late game play combined into one big disaster late. Early in the game the Hawks tried to exploit their advantage and size inside -- and it worked. Marvin Williams was attacking, dunking and hit four of five. Josh Smith and Al Horford were getting good looks. The only thing that kept the Bucks in it was Brandon Jennings, who kept going around the pick, getting a Hawk big to switch on him them blowing by for a layup, or hitting the jumper over him. Jennings started 5 of 7 while the rest of team was 4 of 14 in first quarter. Late in the game, it was John Salmons doing the same thing off the same plays for the Bucks, and he had eight points of their 14-0 run. Late in the game Hawks stopped going inside, they stopped making good passes into the post. They went to isolations, and the result was help on drives where the Hawks missed layups. I know I've spent my entire HawkStr8Talk blog career trying to explain why this isn't an organization that has been committed to making championship moves, employing a championship strategy, and having championship heart. But it doesn't feel good to be right about anything. Is the series over? No. The Hawks still can win two in row easily. The drastically disappointing thing about this whole series is that our team could win the next two games quite easily. But it certainly feels over. And that is the sad thing. This team, this rebuilding process seems over (not done but certainly a chapter complete). Let's forgive the Hawks, anyone of us who ever assumed one of their blown fourth quarter leads was caused by disinterest. Tonight, at home, in a playoff game, in a playoff series tied at two games each, they scored 5 points* and allowed 18 in the final 3 minutes and 54 seconds to fall behind three games to two and head back to Milwaukee, where they've lost both games this series, in particular and the road, where they've lost 10 of 11 playoff games, in general. *And the 5 points they scored came after the Milwaukee Bucks had scored 14 straight. Even the nine-point lead the Hawks blew ended badly, with points 81 and 82 coming on a terrible possession that began with Joe Johnson making no effort at all to work fro an angle from which to feed Marvin Williams (guarded by Luke Ridnour, a matchup that had led to five Atlanta points on the previous two possessions) in the post and ended with a Josh Smith jumper (made, quite unexpectedly) with less than five seconds left on the shot clock. John Salmons beats Josh Smith (who had switched onto him) off the dribble, draws a foul on Marvin Williams, and makes both free throws. On the other end, Josh Smith misses a layup. Salmons then makes a three-pointer while Joe Johnson worries about a yet-to-be-set ball-screen (that, evidence suggests, he would not have fought through anyway) from Kurt Thomas. On the other end, Jamal Crawford misses a layup. Joe Johnson commits his fifth foul closing out recklessly on Brandon Jennings beyond the three-point line with two seconds left on the shot clock. Jennings makes the first free throw. He misses the second wildly but Ersan Ilyasova beats Josh Smith to the rebound. Eventually, John Salmons gets Al Horford switched onto him, beats him off the dribble and gets fouled at the rim by Josh Smith. Salmons makes both free throws. The Hawks take 12 seconds to set up a 1-4 set for Joe Johnson. With nothing doing and the shot clock dwindling, Johnson puts his head down and runs into Kurt Thomas in the lane. It's Johnson's sixth foul. Ersan Ilyasova, after saving a mis-timed pass from John Salmons from going out of bounds, takes the ball from the left block across the lane and scores over Josh Smith. Smith, a career 26.1% three-point shooter, responds by attempting a three off the first pass with 11 seconds left on the shot clock. Al Horford misses a follow try. Brandon Jennings misses a runner in the lane. Ilyasova gets another offensive rebound and passes out to Carlos Delfino in the corner. Delfino can't find an open teammate, then realizes no Hawk is closing out on him. So he shoots, and makes, a three-pointer. The Hawks call timeout. Three Jamal Crawford misses (all on one Atlanta possession) later the Hawks start fouling intentionally. One John Salmons missed free throw and one Al Horford banked-in three-pointer aren't enough to change the outcome. Taking nothing away from the Bucks, who executed flawlessly on the offensive end down the stretch, it was also a complete meltdown on both ends for the Hawks, reminiscent of many (all?) of the late leads they blew in the regular season, and, barring an atypically strong performance away from home, the beginning of the end of five years worth of progress as a franchise. – The better team is not playing as hard as it should. – The better team is not playing as smart as it should. I contend there's a third possibility as well: the Hawks have but two good (two very good) defensive players, the Bucks have figured out how to neutralize the impact of those two players (at least as long as the Bucks make almost 60% of their shots), the Hawks may be over-compensating for their (admittedly numerous) poor defenders, and, underpinning all of these specific reasons: It is hard to play good team defense without good defensive players. Mike Bibby is a poor defender. Jamal Crawford is a terrible defender. Joe Johnson has amply demonstrated he cannot keep Brandon Jennings in front of him. Nor can Johnson fight through a Kurt Thomas screen. It's no surprise that Mike Woodson has tried to address* these limitations. His singular method of address, to switch every screen, has pushed Josh Smith too often to the perimeter, exposing his primary defensive weakness (lateral movement) while simultaneously negating** his overwhelming strength (help defense). *We'll ignore, for the purposes of this discussion, how self-inflicted some of these limitations are. **This is essentially what Orlando's stretch 4 does to Smith when the Hawks play, and, typically, lose to the Magic. Al Horford does an impressive job of moving his feet against smaller, faster players but he's hardly a defensive stopper when isolated against guards 20 feet from the basket. Furthermore, by switching Smith or Horford onto the ball-handler, the Hawks are left with their smaller, slower, lesser defenders attempting (or not) to provide help defense. The defensive rotations are further slowed by the decision to switch off-the-ball screens so that, in addition to being slower and smaller, the Atlanta guards, when defending off-the-ball are not responsible just for recognizing the location of the ball and their man but for the ball, their man, and their next man. As the Utah Jazz have frequently demonstrated against this Hawks defense, the more off-the-ball screens you set, the less Atlanta's defenders move. It's a vicious cycle: the more the offensive players move and interact, the less the defensive players move. It's hard to help from a stationary start. "I just catch myself standing there. Other guys have been doing the same thing, too." Crawford received 580 of a possible 610 points, including 110 of a possible 122 first-place votes. Ten ballots had Crawford in second. Two voters left Crawford off their ballots. One voter gave Kevin Love a third-place vote. I assume that voter was making fun of Kurt Rambis. The Hawks are considering giving a max contract to a 29-year-old guard* who scored points at a slightly lower rate and less efficiently this season than did Crawford. Again, a portion of my post-game reaction was diverted into the Daily Dime (#8). "It is frustrating, man. It just seems like we don’t have the toughness. They were coming up with all the loose balls, and all the big rebounds. We couldn’t get stops when we needed to. It’s killing us." It is frustrating that this team seems surprised about not being an especially good rebounding or defensive team. "It’s been tough because we switch a lot and they just get pretty much any penetration they wanted. They got us helter skelter, to where we are scrambling trying to find guys, and now we are at a disadvantage." "Jennings has such quickness that when we get out on him he opens up stuff for his shooters. He gets around one person, he keeps his dribble, Delfino was getting shots Salmons was getting shots, Stackhouse was getting shots Ilyasova was getting shots. I think the penetration is hurting us a little bit." "I am sure we will come up with something. We have just got to get back playing with energy. They are getting layup after layup, you can’t have that in playoff basketball." Had the Hawks not had that in regular season basketball, the determination would be more admirable than quixotic. "We have got to stop complaining so much. We worry about them holding and scratching and clawing. We have just got to do the same thing. Stop worrying about what the refs are calling, and just play. We complain way too much." "We need everybody to play as well that we can get." "We have to be a little bit careful. We were back to holding the ball a little bit again, but we were able to get away with it. But we were also driving the ball aggressively and trying to get to the line. Those are split-second decisions that are often difficult to make, especially against a team that's long. We want to drive their switches, but at the same time we also want to keep the ball moving." "Somehow we've got to get our defensive mojo back where we're defending and rebounding and running up and down the floor." 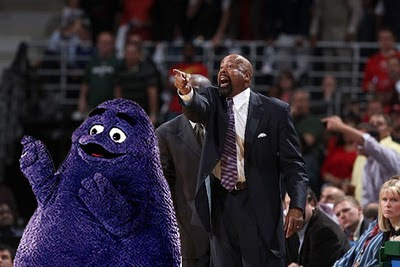 For more on Mike Woodson, check out The Vent. Woodson has been through the playoffs and taken an NBA title as a Detroit assistant, but he hasn’t gotten a better team — and the Hawks are clearly more talented — to lock in the way Scott Skiles has. In Games 3 and 4 the Bucks kept finding open shots, while the Hawks approached every position as a degree-of-difficulty challenge. Afterward one Hawk was heard to wonder why Mo Evans, not known as a scorer, wound up shooting (and missing) on three consecutive fourth-quarter possessions with the Bucks’ lead down to six points. There’s no answer except to say: That’s what the Hawks do. When in doubt, they don’t look for the open man; they look to shoot. You know what the Hawks are going to do on every pick and roll. I know it. Every hoops fan knows it -- the Hawks switch. They think their bigs -- Al Horford, Josh Smith -- are quick enough and long enough to bother point guards into bad shots. Not Brandon Jennings. All night in game four (and through large parts of game three) he abused the Hawks bigs. Half of his 16 shots came as layups, four more came right on the edge of the key. On those he was 9 of 12. He was killing the Hawks because the Bucks got the matchup they wanted, and they isolated it. Atlanta tried some traditional pick-and-roll defense, but the guards showed no passion to fight through the pick. Even if he did fight through it, Jennings blows by Bibby faster than Smith or Horford. The Hawks live and die with their athletic bigs partially for that reason. "I think he just kind of caught me off balance. I was just trying to hold my ground. But yeah, I guess he's been in the weight room a little bit." Oh, Deer. We have a series. For the very first time in his NBA career, [Brandon] Jennings shot over 50% in a game in which he failed to connect on a 3-point basket. As do these pictures of a phantom switch at NBA Playbook. Milwaukee made at least one good adjustment (putting Luc Richard Mbah a Moute on Josh Smith instead of Joe Johnson) and lots and lots of shots at home but the Hawks have been complicit in evening the series. Over the course of the season, the Hawks established themselves as a mediocre team both on the road and when the other team had the ball (regardless of a game's location). To secure the first of their eleventh straight road losses with a final margin of less than 18 points, the Hawks needed Mike Bibby to make 5 of 7 three-pointers, Josh Smith to turn four long jump shots into seven points (and, almost as improbably) make five of six free throws, and a 13-point fourth quarter from Joe Johnson. There were two reasons why: 1) The Hawks couldn't stop the Bucks from scoring and 2) The Hawks couldn't or wouldn't re-create any of the offensively advantageous situations that made the victories in Games 1 and 2 possible. The two reasons are related. It's difficult to start a fast break when taking the ball out of your basket. It's easier to give up points when your defense isn't set following your own score. Neither is a suitable excuse for allowing Mbah a Moute, gifted though he is, to turn Josh Smith into a non-passing jump shooter or forgoing the pick-and-pop with Al Horford (something Milwaukee has yet to solve). Smith and Horford are not absolved of responsibility for their relative lack of production in Games 3 and 4 but their defensive effort deflects some of the blame. Especially in comparison to the guards who have taken, over the last two games, short breaks from dribbling and shooting to run into the nearest ball-screen, abdicate their assignment of Brandon Jennings or John Salmons, and rest up until they get to touch the ball again. Yes, Kurt Thomas is setting lots of hard screens of narrow (if any) legality. No, the Atlanta guards are not making a good-faith effort* to fight through them. Nor are they doing much of anything after the switch to keep pace with Milwaukee's movement off the ball. *The false hustle displayed by Jamal Crawford and Mike Bibby in knocking Thomas over in frustration in the fourth quarter might endear both of them to a head coach who played Mario West 79 more seconds than he played Al Horford (2 fouls) or Jeff Teague in the second quarter, but neither action provided any tangible value. The historical disparity between Atlanta's quality of play at home and on the road suggests that drawing strong conclusions from Games 3 and 4 would be foolish and that the limitations evident in this team may not cost them this series against an under-strength Milwaukee team. The historical record of this team should, even as it's being written, influence what one hopes are realistic, honest, and ambitious decisions about the future. Brown is angling to take the Philadelphia 76ers’ presidency, and has targeted Washington Wizards front office executive Milt Newton as his general manager and the Atlanta Hawks’ Mike Woodson as coach, sources said. [T]he possibility is strong that Brown will coach the 76ers, because Woodson wouldn’t leave an Eastern Conference contender unless the Hawks low-ball him in contract talks at season’s end. His deal is expiring with Atlanta, and several sources familiar with the Hawks’ plans predict an offer that Woodson could easily refuse. [T]he possibility of Brown coaching the 76ers could rest largely on how things play out with the Hawks. There’s been a cool relationship between management and Woodson, and sources say that the organization’s priority isn’t to reward him with an expensive contract extension. The Hawks are pooling resources to get maximum money available for Joe Johnson(notes). The message has been made clear to the Hawks: Offer Johnson a max contract extension on July 1, and they’re likely to keep him. Sources say that this is the reason Atlanta is willing to sell its first-round pick for $3 million this summer, and the reason that they’ll likely offer no more than a three-year contract for $1.8 to $2 million a year to a possible Woodson successor. Milt (Alfreeka) Newton getting a GM job is about the fourth most interesting (to me) thing in this story. PREVIOUSLY...the Milwaukee Bucks beat the Atlanta Hawks 107-89 on Saturday when the series moved to Milwaukee. Quotes, notes, and links from Game 2. "It’s unacceptable to get blown out like this. We’ll look at the tape and correct our mistakes, but more than anything it’s about coming out and playing with more effort." Lack of effort is and has been the go-to excuse for almost every bad loss the Hawks have suffered for the last three years. Sometimes it's a valid excuse. There's no simply no way (or need) to give 100% effort for the entirety of an NBA season. Sometimes it's, if not a red herring, a stand-in for the team's limitations of talent (especially defensive talent) and/or tactics. This team has one way to play defensively and tends to catch-as-catch-can in terms of the offensive point of attack. If either fails them, a deflated feeling may arise but that's due more to a lack of confidence in their own ability to adjust than a lack of effort. I re-watched and detailed the first 31 possessions from Game 3--from 0-0 to 29-13 Milwaukee. I saw few instances of poor effort and many instances of the things the Hawks typically do (switching screens, asking Joe Johnson to mark the opposing point guard, converting transition opportunities) not working. UPDATE (9:08 AM): Kris has posted video of three of these possessions as part of a longer discussion of the Hawks' poor defense in Game 3 over at Soaring Down South. Salmons beats Williams off the dribble. Horford and Smith help in the lane. Salmons finds Delfino in corner for open 3 (over Bibby), which he misses. Johnson gets the ball at the elbow on a curl. Jennings shows at elbow upon receipt. The ball swings to Bibby, then Williams, who gets open pull-up jumper at 14' on baseline, which he misses. Delfino dribble-drive v. Bibby leads to missed scoop at rim. Williams kicks defensive rebound ahead to Smith who is fouled on fast break layup attempt. He makes 1 of 2 free throws. Mbah a Moute dribble-drive from right baseline v. Smith. Scores on up-and-under in lane. Horford gets ball at right elbow. Nothing doing. Kicks it back out to Johnson. Smith sets baseline screen for Bibby. Jennings really overplays the curl so flares to the corner. Johnson finds him for wide-open 21-footer, which he makes. Salmons beats Williams off dribble for uncontested lay-in. No help from Smith. Horford was covering Thomas who went to set ball-screen for Salmons as Salmons went to basket without. Before first pass, Bibby takes contested 18-footer with no teammates within 20 feet of the basket. He misses. Johnson gets caught under Thomas moving screen. Jennings pulls up for three in transition. He makes it. Johnson posts up Salmons high on left wing. He makes a step-back jumper. Smith switches onto Salmons on off-ball screen. Horford switches onto Salmons on a ball-screen. Salmons attacks Horford off dribble. Horford cuts him off as Salmons gets first foot in lane, but he makes a fall-away on the baseline. Williams tries to feed Horford in post v. Thomas but can't. Reverses ball to Smith in high post for high-low action, Thomas called for holding foul on Horford. After in-bounds, Johnson looks for ball while posting up Salmons high on right wing. Smith doesn't feed post, takes Mbah a Moute off the dribble. Johnson moves out of mid-post late so Salmons is waiting there to strip Smith. Turnover. Thomas sets ball-screen in transition. Johnson goes under screen/just stops. Jennings hits the three. On 2/5 screen-and-roll, Jennings leaves Bibby completely to cut off Johnson's penetration. Johnson keeps dribble alive, back up as team assumes classic iso-Joe positions. Johnson works from the top of the right side of the key down to the wing and puts up a contested 16-footer. He misses. Smith picks up Jennings in transition (all guards got back on D). Horford switches onto Jennings on ball-screen and prevents Jennings from getting anywhere on the bounce so he gives the ball to Salmons who runs a side screen-and-roll on the left with Thomas. Hawks switch on the screen, then Smith forces Salmons to the baseline help (Johnson). Salmons finds Thomas at 19-feet. Thomas makes the set shot. Horford at right elbow finds Johnson on a tight curl in the paint. Johnson floats pass to Smith who makes a good catch but misses the contested layup. Horford picks up Mbah a Moute and Williams picks up Jennings in transition. On a 1/4 ball-screen, the Hawks switch. Horford forces Jennings high, beyond the three-point line. Johnson gets caught on Thomas screen for a Salmons curl, then fouls Salmons from behind as Salmons makes open jumper at left elbow. Salmons makes the free throw. 1/5 ball-screen at 28 feet. Bibby hits Horford on move at 22 feet. Horford kicks it out to Johnson and sets a second ball-screen (Kurt Thomas is essentially unmoved at the free throw line) at the three-point line. Johnson declines screen and works toward the right baseline. Cut off, he finds Horford at the top of the key. Horford dribbles once, spins on right shoulder, and makes a 13-foot fall-away. Salmons throws pass to Bibby. It defies explanation and more elaborate description. Williams misses fast break layup. Smith needs two tries to convert the follow. The Hawks switch a 2/5 ball-screen. Bibby had previously switched onto Thomas on weak side off-the-ball screen. Salmons backs Bibby down, makes 8-foot turnaround. Smith, from the high post, finds Johnson on curl at left block. Johnson makes a good catch, then overpowers Salmons, makes a semi-hook in the lane, and gets fouled. He misses the free throw. 3/5 ball-screen. Hawks don't switch. Nothing doing. Johnson (after switching an off-the-ball screen) breaks up reversal intended for Mbah a Moute. Smith stops short on 1-on-3 fast break and lays the ball off to the trailing Horford who misses a runner in the lane. Bibby picks up Jennings in transition. On a 1/5 ball-screen, Horford helps but doesn't switch then closes out on Thomas to prevent the shot on the pick-and-pop. Thomas returns the ball to Jennings and sets another ball-screen. Horford traps with Bibby which fores Jennings baseline. He fins Delfino in the corner. Johnson forces Delfino baseline and into Horford. Mbah a Moute cuts down the center of the lane with four Hawks now on the strong side. Delfino finds him. Smith provides help from weak side but at a poor angle and Mbah a Moute lays it in just before the shot clock expires. 1/4 ball-screen on right side. Might have been intended as a screen-and-roll but Smith stands on three-point line after Bibby passes. Bibby tries to find Williams cutting through lane from the weak side but Salmons breaks up the pass. Turnover. Smith chases down and blocks Delfino dunk attempt in transition. After in-bounds, Stackhouse posts up Crawford. Johnson shows help but doesn't go. Stackhouse passes out of post to Jennings at the top of the key. Johnson doesn't close out. Jennings makes the 3. From 30 feet, Smith forces pass to Johnson on back cut in lane. Pass deflected to Williams who misses open (but off-balance) 18-footer on wing. Salmons to Stackhouse for corner 3 in transition. Smith is back but can't close out that far. 1/5 ball-screen at 26 feet. Crawford pulls up for 20-footer which he makes. Stackhouse iso v. Crawford on left wing. Johnson again shows but doesn't help. This time, though, he loses Jennings. Stackhouse sees Smith waiting to help in lane and passes out to Jennings on what is essentially a back cut. With one dribble, Jennings is past Johnson. Jennings takes off early in the lane, foiling the timing of Smith's help, and makes his scoop shot. There was better play (and worse) that followed this stretch but it was during the first 31 possessions that Milwaukee dug the hole into which they pushed the Hawks. In their 15 possessions, the Hawks created a handful of open shots and had three fast break opportunities. They only got three points from those fast break opportunities. They made just one of three free throws. Those were errors of execution not a failure to try. On the other end, Milwaukee executed very well and converted an unsustainable percentage of the opportunities they created. Their effort was obvious but it does not necessarily follow that their success is due to inferior effort from the Hawks. Josh Smith's spectacular block of Carlos Delfino's dunk attempt exemplifies the marriage of effort and talent. Al Horford's repeated efforts to stay in front of Brandon Jennings were impressive (and, in and of themselves, remarkably successful) but, ultimately, that effort failed to prevent Milwaukee from scoring. Milwaukee deserves credit for that. Even Joe Johnson, who does not cover himself in defensive glory on a second viewing of the first quarter, looks less apathetic than overmatched both by the speed of Brandon Jennings and the solidity of Kurt Thomas's screens. Effort wasn't an obvious problem early in the game certainly not as obvious as a good offensive team failing to convert chances with its usual frequency and a mediocre defensive team suffering from the opposition's hot shooting. The Hawks capitulated late. They had chance to do so not because the Milwaukee Bucks out-worked them earlier but because the Bucks out-played them.